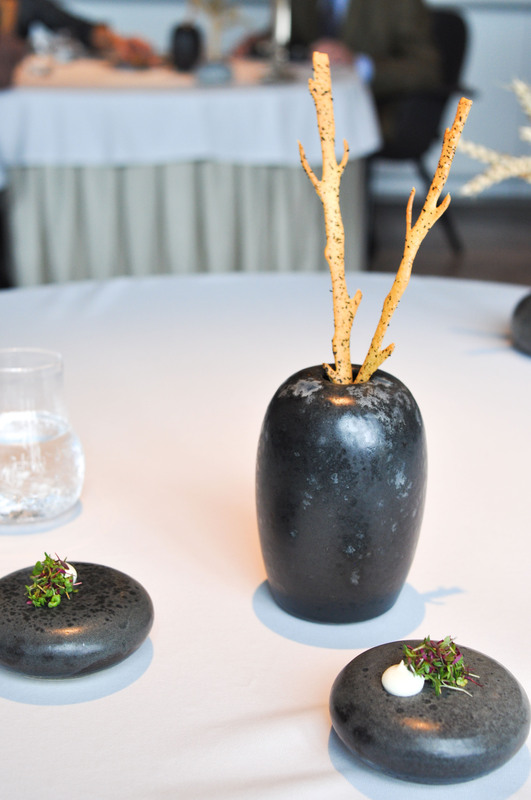 After following the success of Chef Rasmus Kofoed in the prestigious Bocuse d’Or competition(three medals, including one gold in 2011), I decided that a visit to his restaurant Geranium, in Copenhagen, would be a great addition to the line-up for me and Rocky’s recent Euro-eating-trip. Coming off of a killer two-a-day at Noma the day before, we made our way to Geranium for lunch. 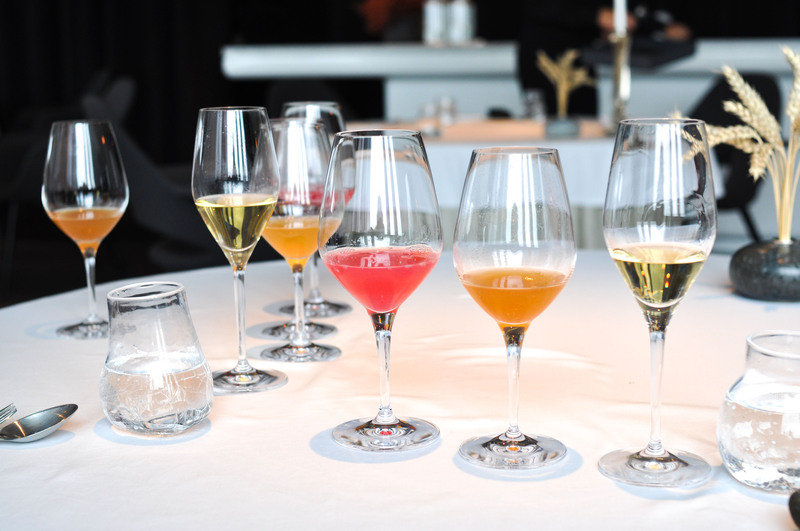 Before arriving, we had already decided we were having the Lunch Universe Tasting Menu with their juice pairings(which were overall great, at moments transcendent) and a bottle of Champagne. Seaweed Chips. Good crunch with good ocean flavor. 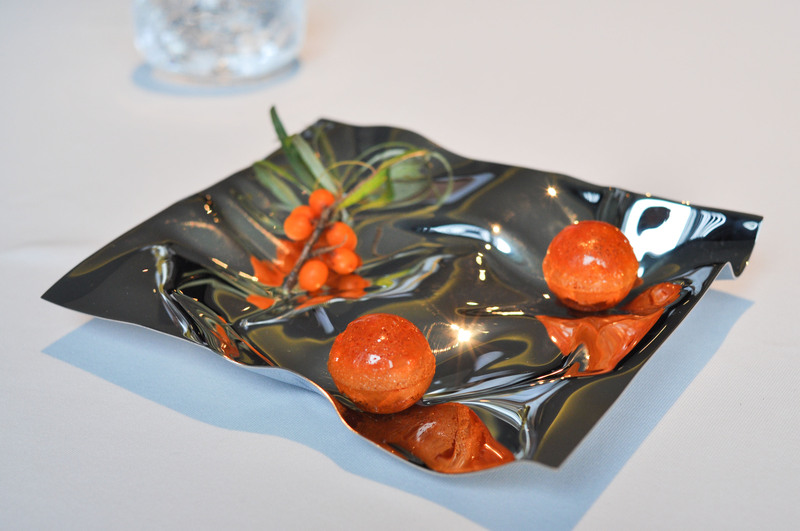 Carrot & Seabuckthorn. Delicate shell that was almost like candy, but not too sweet. 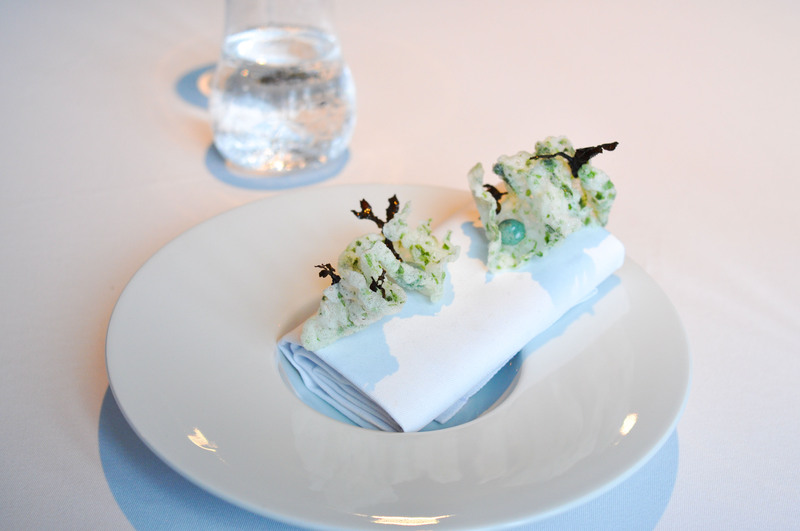 Sea Salt Cheese & Ramson. 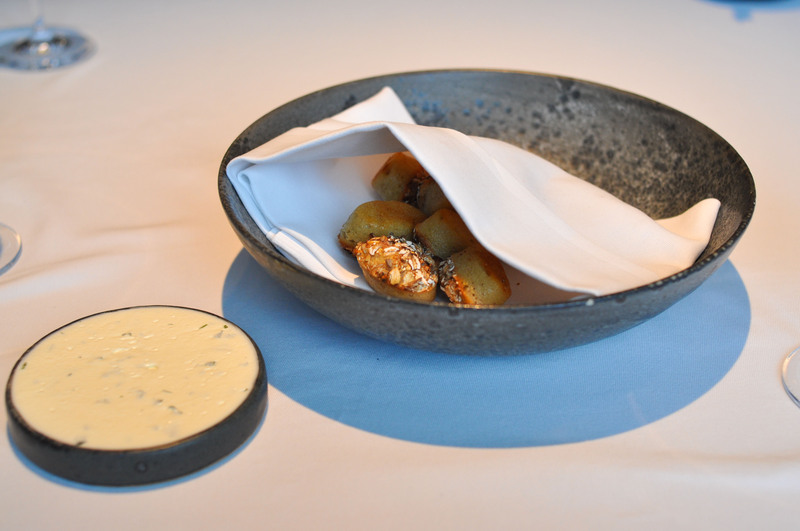 Savory cheese ‘sticks’ with ramson mayo for dipping. Dried Flowers & Apple. Great floral and fruit flavor in a bite size packet. Mushrooms. Pickled mushroom soup. Very light body and taste. Maybe too light. 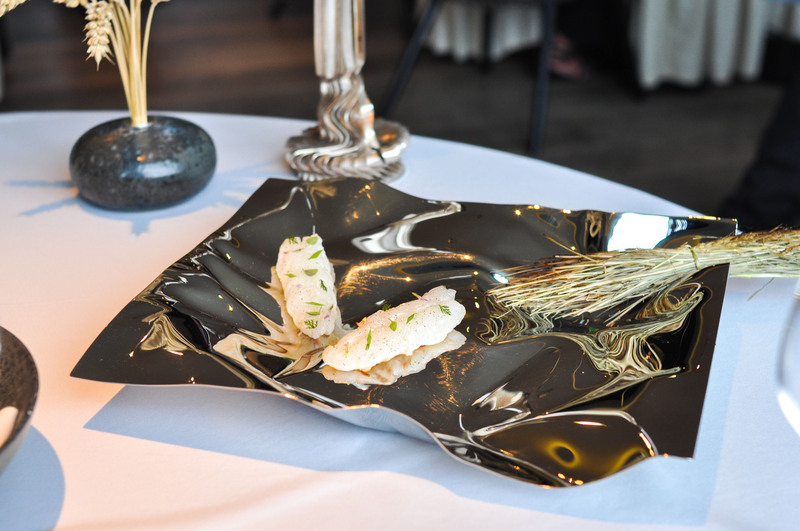 “Razor Clams”. 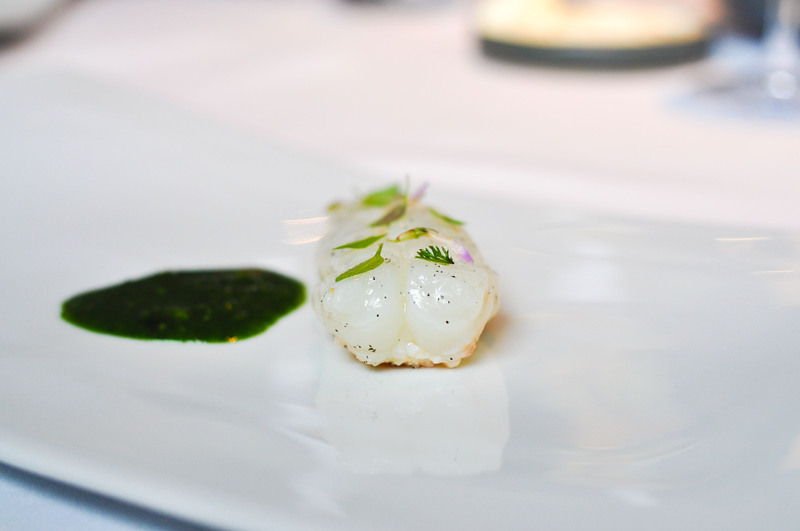 Crisp, brittle, faux shells with razor clam, creme fraiche, and parsley. 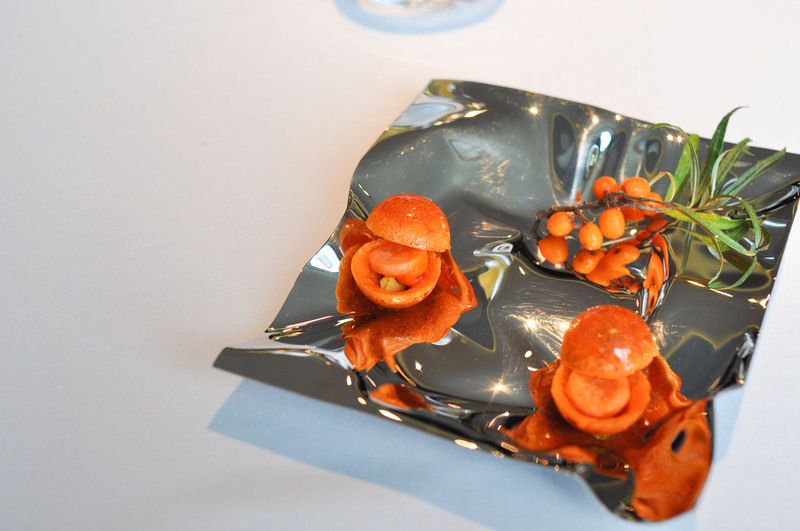 Apparently edible fake shells are en vogue in haut cuisine. 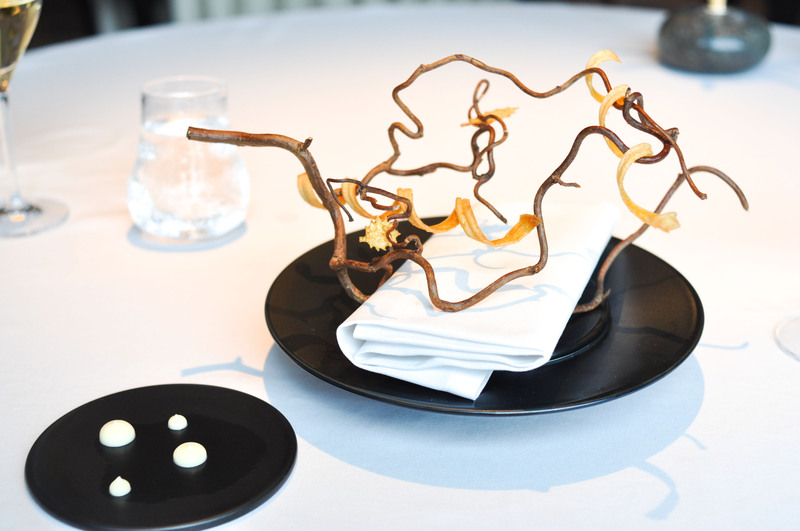 Jerusalem Artichoke “Tree” & Walnut Oil. These crispy strips of tubers were tasty snacks and were fun to eat. 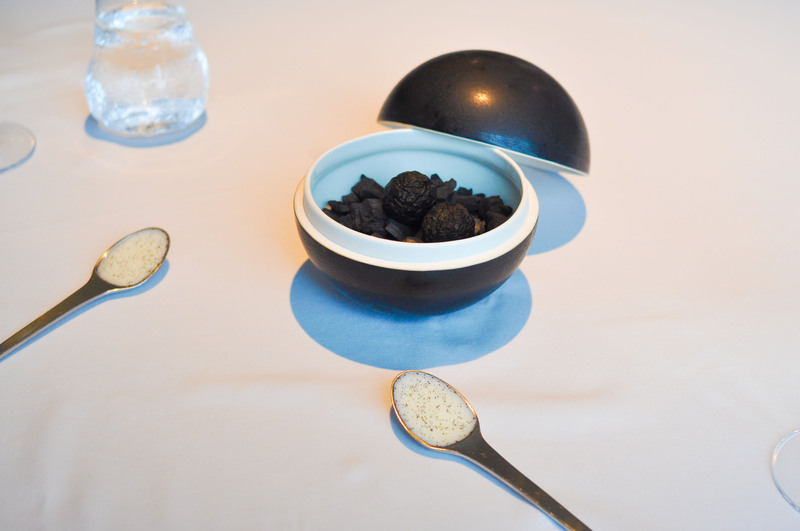 Burned Potato & Sheep’s Milk Butter. Charred potatoes, to be placed on spoons full of flavored sheep butter and eaten together. Nothing wrong here. 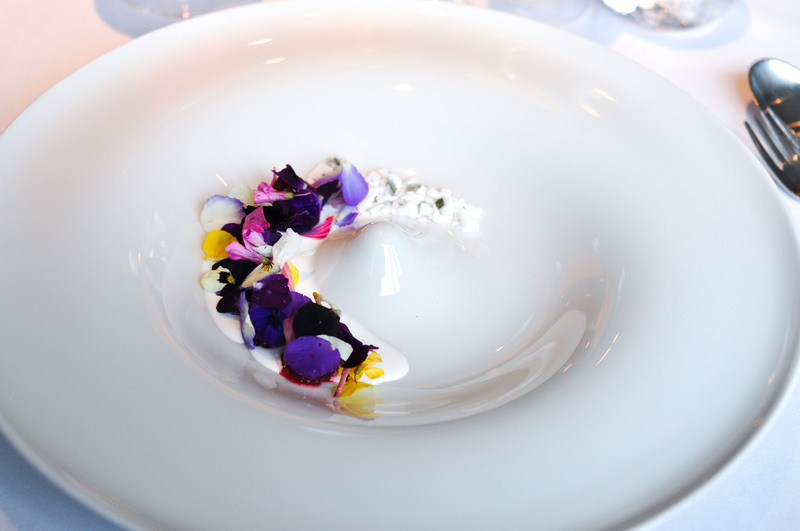 Jellied Ham, Tomato Water & Savory Flowers. Beautifully light savory flavors freshened with lemon thyme. Brilliantly paired with pine needle lemonade. 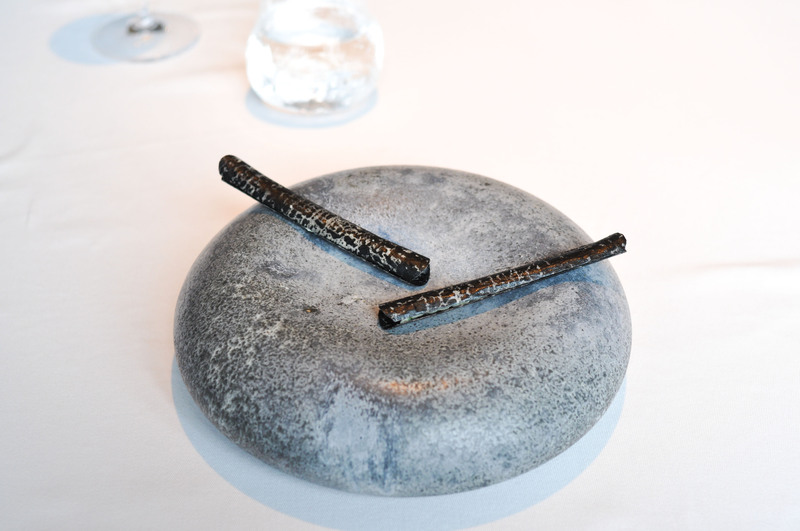 “Dillstone” & Fermented Vegetables. 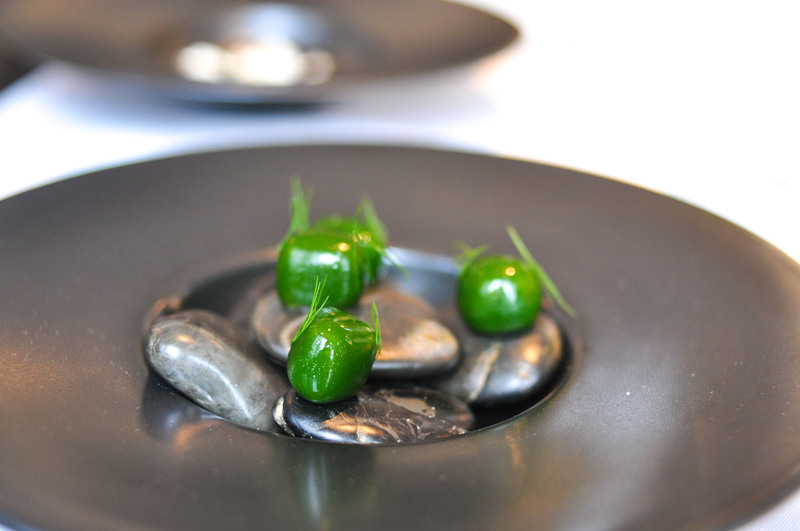 Visually arresting, the ‘stones’ were like denser, smoother, herbaceous gum drops. To be passed through the vegetable and salmon roe sauce. 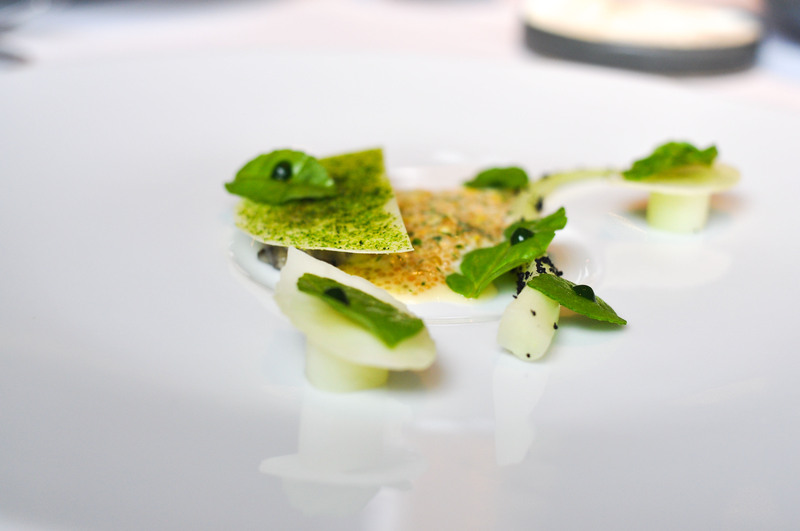 Mackerel, Burned Juniper, Horseradish & Cucumber. 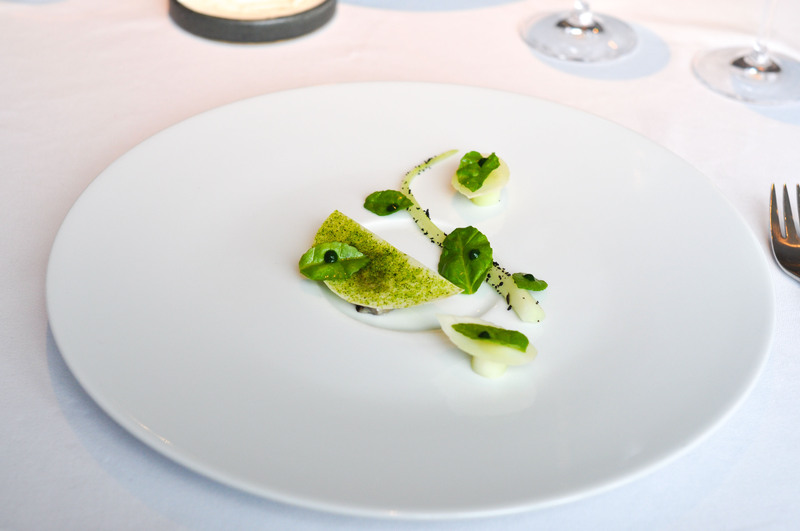 The granite of cucumber and horseradish was impeccably balanced with uplifting freshness and spice and played perfectly with the salted mackerel. 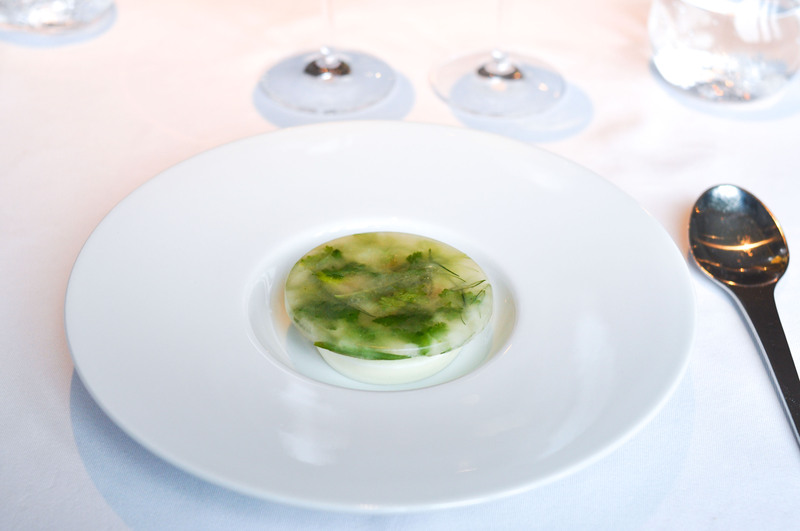 Served with green apple, cucumber, elderflower juice, which was exquisite. Bread with Emmer & Spelt. Small sourdough grain bread with buttermilk butter. Onions & Melted Hay Cheese. 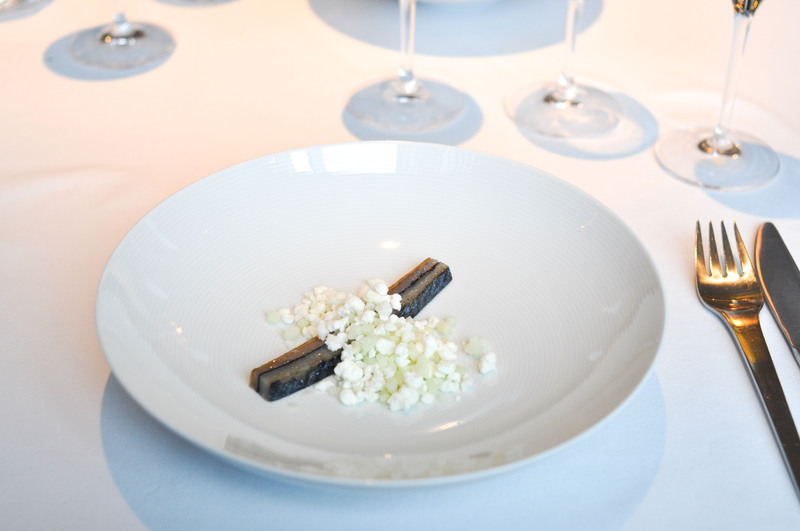 Wonderfully restrained allium flavors balanced by a soup of melted hay cheese and topped with crumbled rye bread and chamomile. 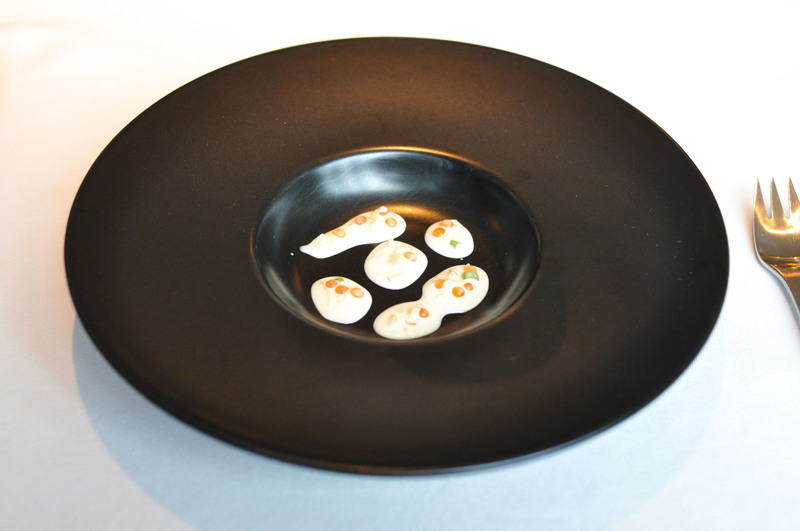 “Iron & Minerals” A superb lightly cooked oyster, cabbage, and bleak roe sauce. 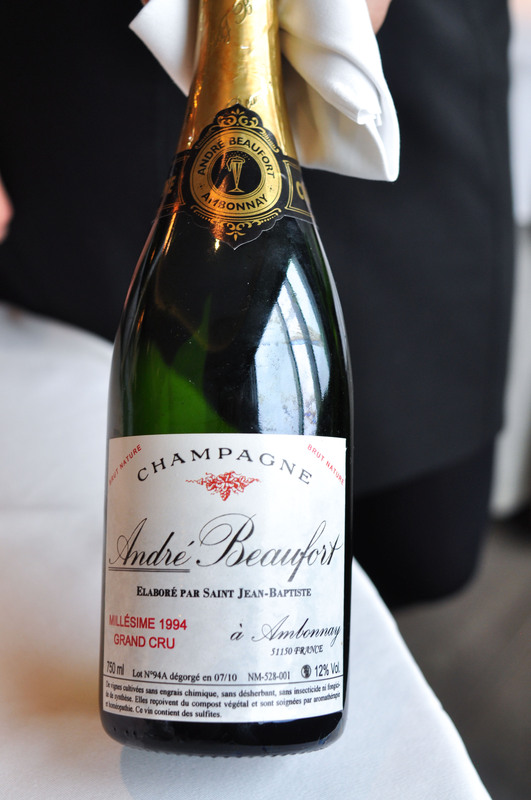 Paired with a vibrant apple and tarragon juice. 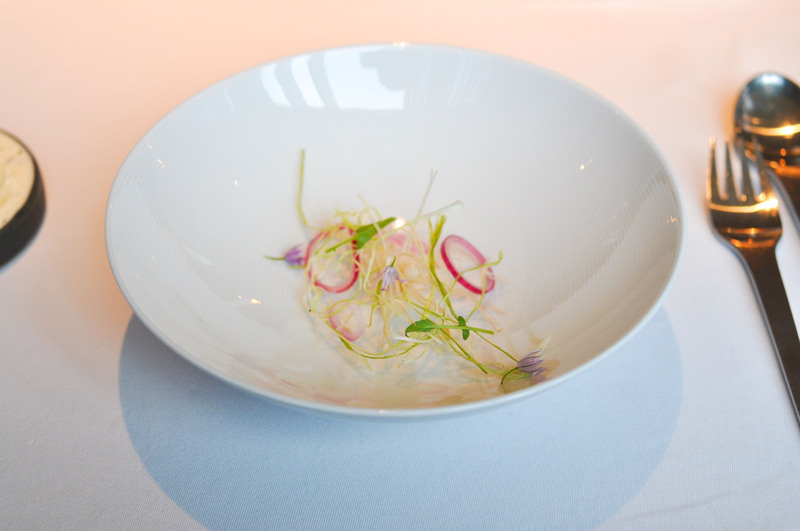 Langoustine & Hay Aroma. 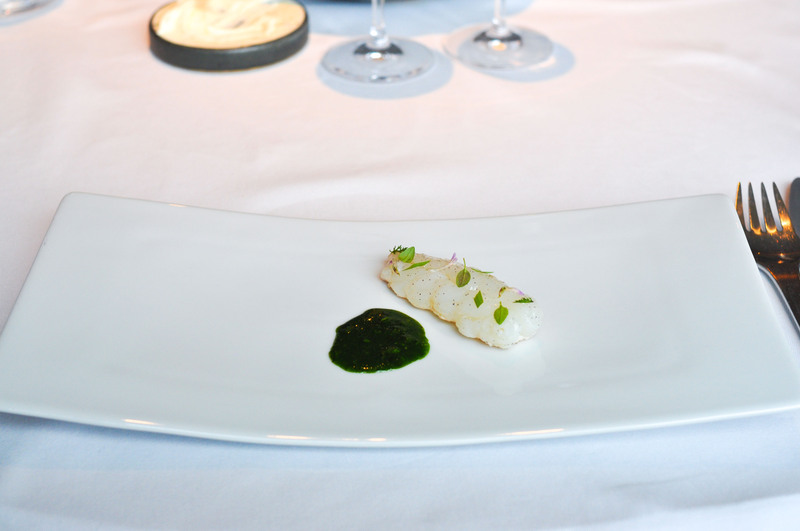 A nice savory, perfectly seasoned langoustine with herbs, flowers, and lovely herb sauce. 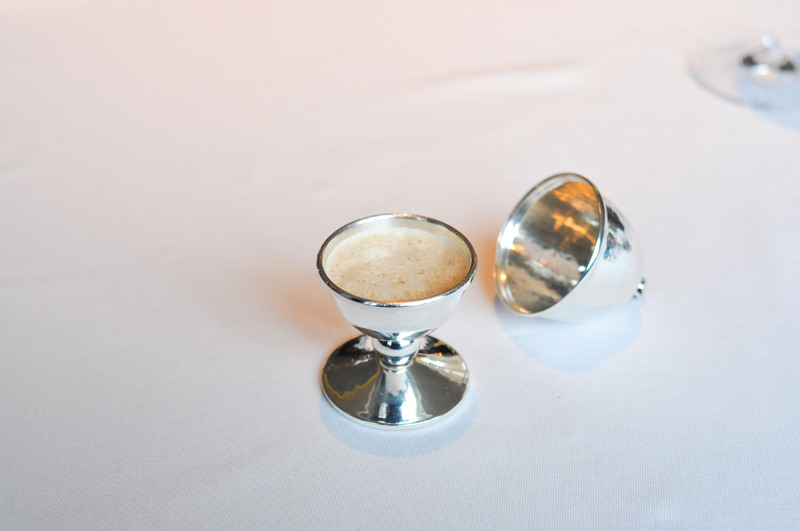 The apple juice served alongside was far too sweet for the dish, but our Champagne was great. 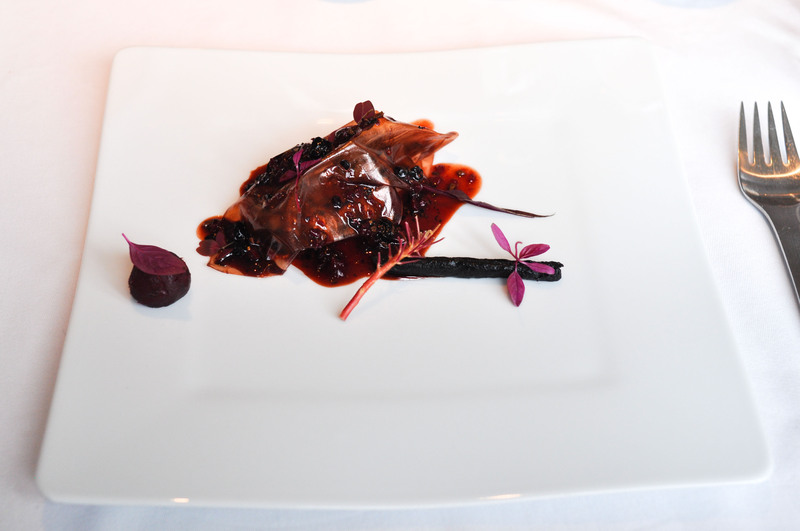 Venison, Red Leaves & Stems. Holy smokes. This dish was effing incredible. 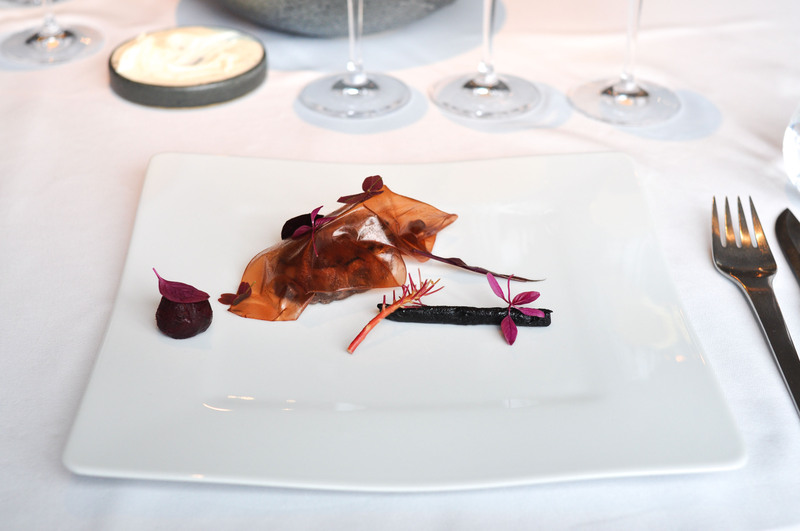 An intense venison tartare, cherry vinegar gelee, beets, and dried mushroom and berry sauce. 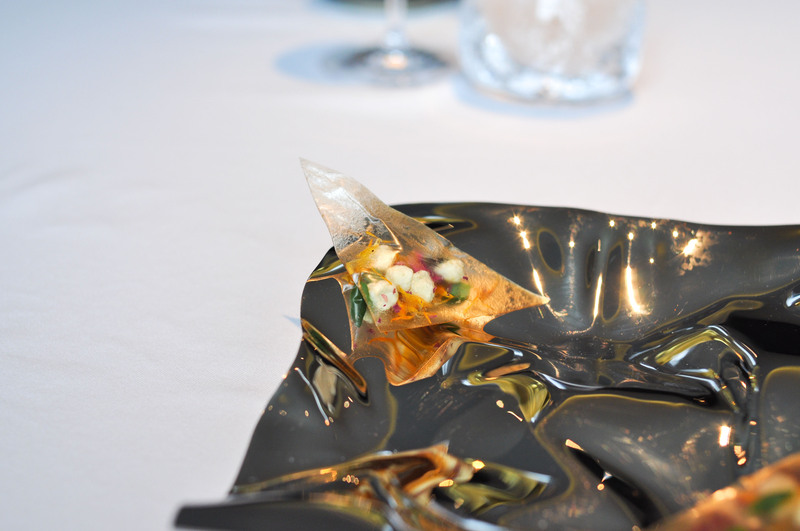 All the components were individually very bold, and yet all worked to together to elevate the whole plate. To match, we were poured juniper berry and red grape juice, which was good stand alone, and with the food, put the combo in contention for the best pairing of the trip. Elderflower Soda. 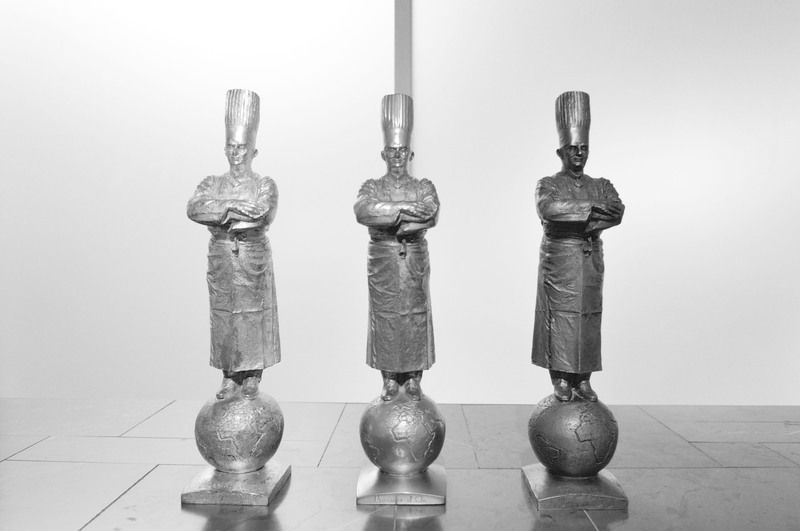 After savories, we were invited into the kitchen to have a little treat of elderberry gelee with sparkling elderberry foam, while standing at a high top adorned with three Paul Bocuse statuettes. 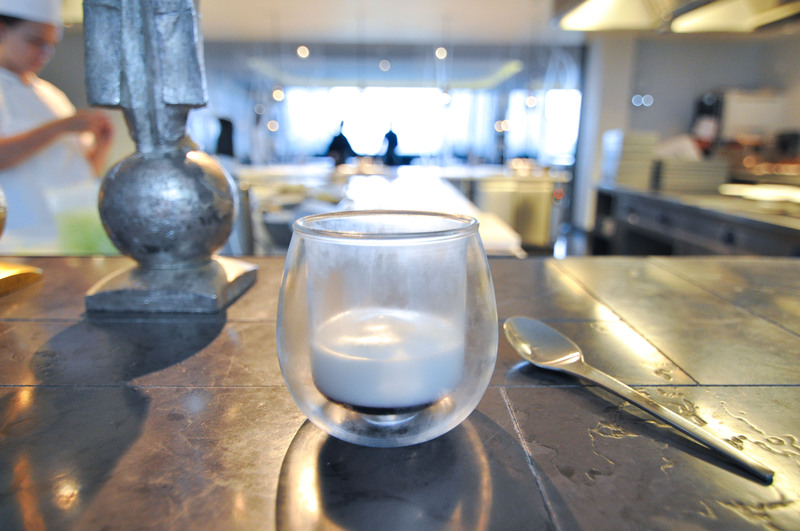 Herb Tea, Plums & Sheep’s Milk Yoghurt. 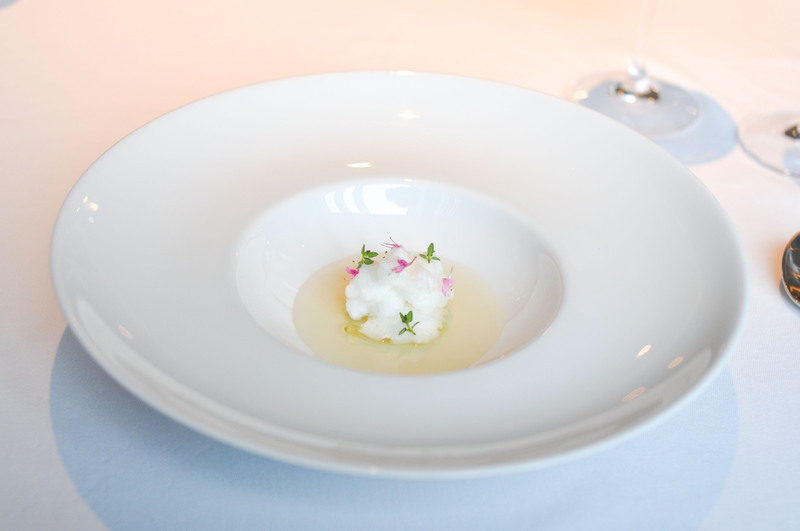 Lemon balm herb ice with sheep yogurt and yellow peaches. Very cooling and refreshing. Paired well with green plum, lemon balm lemon juice. Grilled Raspberries “Flora Danica” & Goat’s Milk Cream. Grilling the raspberries concentrated the sugar just enough to suit the tang of the goat milk cream. 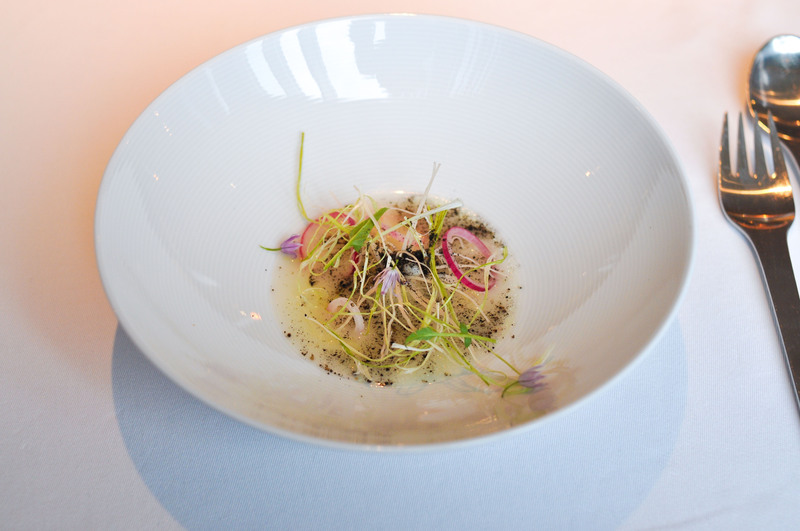 The flower petals and crystallized thyme were as pleasing to the palate as they were to the eye. The rhubarb rose petal juice complemented nicely. 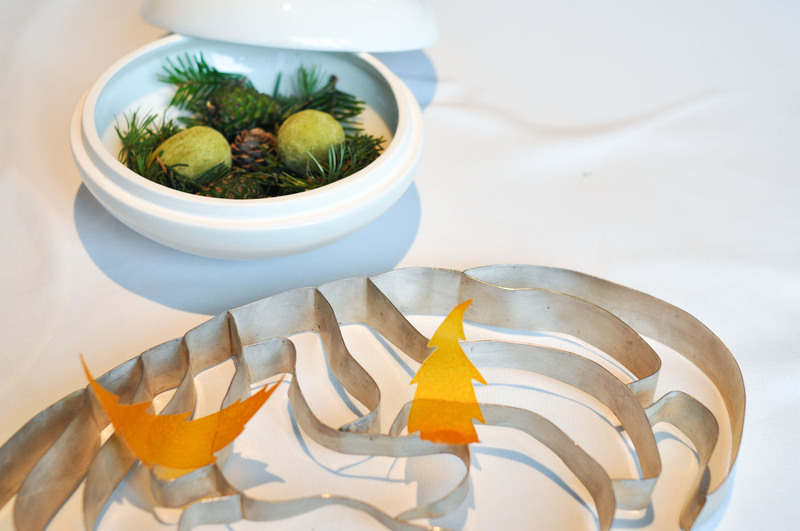 “Green Egg” & “Carrot Leaf”. Light, sweet carrot leaves. Chocolate, caramel, pine ‘eggs’. 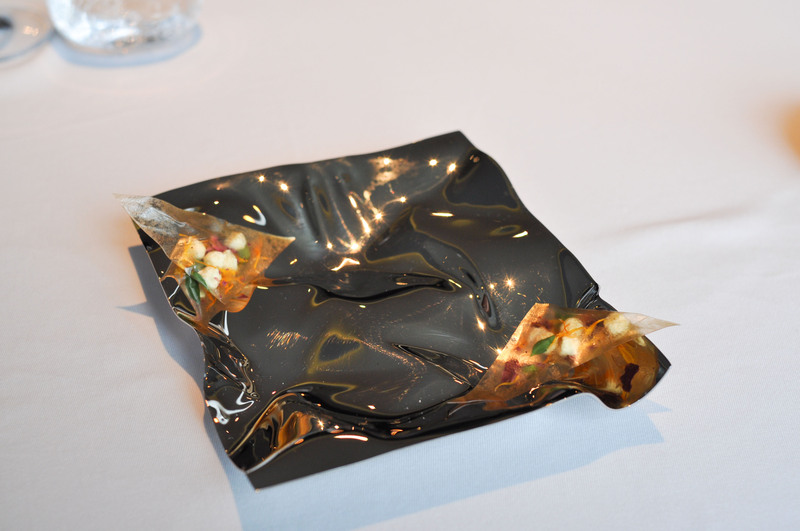 Kofoed’s food is beautiful and thoughtful, with disciplined, restrained vibrance. 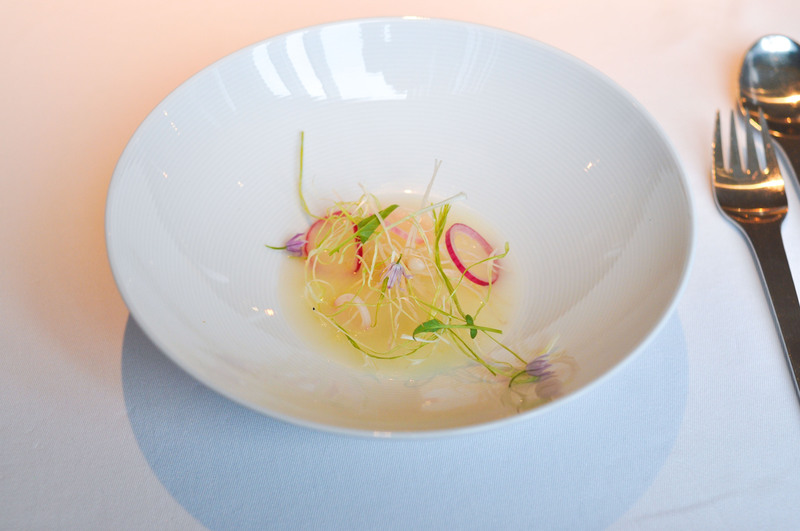 Our experience at Geranium was enlightening and just overall classy.